NOTICE: Activation key must be used on a valid Steam account, requires internet connection.ABOUT THE GAMEDemetrios is a quirky point and click adventure game inspired by classics like Broken Sword, packed with tons of humor! Bjorn Thonen, a slob of an antique dealer living in Paris, is robbed one night after coming home drunk. Forced to conduct his own investigation with the help of his neighbor Sandra, he ends up involved in a murky, mysterious affair. Will these unlikely heroes be able to rise up and discover ancient secrets? The game offers situations and puzzles for beginners and experts alike, with a high degree of interactivity. Explore ridiculous item combinations, just to see what happens! 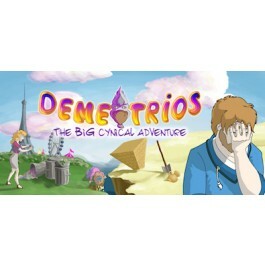 Demetrios features Full HD, hand-painted visuals and animated characters in first person view, similar to visual novels. You might encounter a little pinch of Discworld (some of the humor), Gabriel Knight (comic cutscenes, characters heads/dialogs), Phoenix Wright(first person view investigation)...A long, varied, standalone adventure (8 to 12 hours of gameplay)Over 15,000 lines of dialog, filled with laughs!Hand drawn art in Full HDHigh level of interactivity. Characters react to your actions!Fun mini-games throughout the storySearch for hidden cookies on every screen for optional puzzle hints!Compatible with gamepads, for relaxed, television viewing!